Is anyone else having problems getting PB to play Claire Hart Classic? I guess not? I tried three browsers, two computers... no good. Yes, I have the "EXACT" same problem. Was using Chrome...I'll try some other browsers and maybe they will work. Opera and IE are also BAD! Seems like I ran across this problem before. Not sure what the solution was. I had same issue and had PB support tell me they had no idea why it was doing it lol But the reason it won't work is because it can't be in full screen put it in windowed mode and the auto works as intended. I don't know why the devs don't even now this i talked to them 3-4 times about it clicking forever and never finishing any stages and was told same thing again and again which was "You have to wait 2 mins for it to cycle thru all the checkpoints and it will finish" And i kept trying to tell them "DUH!" I know that and that it didn't EVER finish a stage no matter how long lol. I loaded up edge and it auto loaded in windowed mode and the auto started working fine i don't know if it works same in chrome or IE but i will check and update my post. Sorry, I missed this post. Are you still having issues? No auto is working, including PB. It scatters the cursor around for a bit, then stops, restarts the game and does the same thing again. I've checked settings, tried Chrome/Edge/IE/FF - on my laptop and desktop. Still not working and I really don't want to find 1000 objects (small whine). Thoughts? Are my posts invisible? 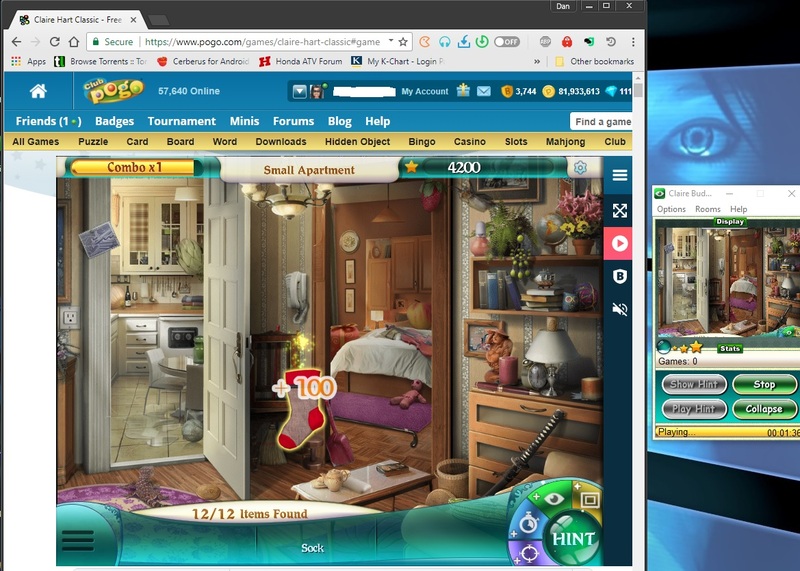 lol I posted how to fix it above post #24 with a screen capture of it finishing stage the game has to be in windowed mode for pb auto to work correctly i tested it on chrome/torch and Edge and it worked on all 3 in windowed mode i don't know why but i know it works because i finished the egg badge for Clair Classic in about 45 mins to a hour i can't remember as i set it and walked away and came back some time later to it being done lol. Well, I'll be dipped and doodled! There it is! I'll try what you posted, Krazy, thanks so much. lol your welcome let me know if ya need with it. It's working now, thank you. It sure is slow, though. NOT COMPLAINING! I don't have to search for 1000 objects, it does. lol yeah won't win any races with this game i hate it but it will get it done for ya glad it is working for you now.